Buy and earn 699 points valued at £6.99. Ultra-rare. 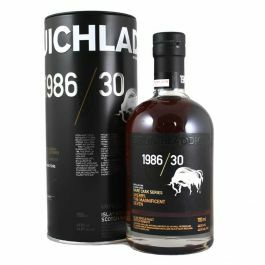 This is an elegant, floral Bruichladdich with intense, full-term sherry maturation. First filled into Oloroso butts in 1986, this spirit lay untouched in our loch-side warehouses until 2012 [already 26 years old], when then Master Distiller Jim McEwan decided to supercharge this sublime single malt by filling it into privileged parcel of Pedro Ximinez butts from winemaker Jan Pettersen at bodega Fernando de Castilla. Limited to 4,200 bottles, the 1986 is bottled at the distillery without chill-filtration or artificial colouring at the natural strength of 44.6% alc. vol. Nose: Dried fruit - raisins, fig syrup, prunes and Christmas cake. Muscovado sugar, a hint of hot sand and candied peel, dried tea leaves, pipe tobacco and leather rolled in PX. Palate: The aroma is truly astounding. On the palate the experience raises the bar still further with sweet PX notes, raisins, dried figs, dates, grape sugar. Leather, cigar boxes and Christmas cake. Everything a Sherry matured whisky should be and more. The complexity and balance is retained as the marine freshness and fruity notes of apricot and apple come through from the Bruichladdich DNA.